Hualong (Tb: Bayen, Palung) Hui Autonomous County is located in Haidong (Tb: Tsoshar) Prefecture of today’s Qinghai Province. It is one of several Hui designated Counties and Prefectures that can be found across the PRC today in several Provinces, including in Qinghai and Gansu. The Hui people are the third largest ethnic group in the PRC after the Han and the Zhuang, they are predominantly Muslim. The post refers to a specific community called the “Tibetan Hui” in Bayen County and is a response to academic research done by Professor Yondrol K. Tsongkha of Lanzhou University. A special thank you to Palden Gyal for this translation and be sure to scroll down to the end for the Translator’s Note and recommended further reading. The day before yesterday, I accidentally came across a widely shared research article on Hualong “Tibetan Hui” identity in my WeChat Moments feed. It is titled, “The Transformation of the Cultural Identity of Hualong Bod-Hui (Tibetan-Hui),” and authored by Professor Yondrol K. Tsongkha of Lanzhou University, Centre For Studies of Ethnic Minorities in Northwest China. People who hear or come across topics related to “Tibetan Hui” for the first time entertain a sense of curiosity while reading such articles, and such papers, videos or images have a characteristic of seeking novelty. However, because many of the readers or onlookers do not really seem to understand the subject matter being discussed in the paper, and thus lacking the capability for discerning the content, they easily fall prey to and accept the partial and prejudiced views. After all, many people do not really recognize “the danger of a single story.” I had previously paid some attention to peculiar social phenomena and related research works on topics such as “Tibetan Muslims.” It is also because Hualong is my homeland and the place where I grew up. Therefore, after reading this research article, I cannot blindly accept or agree with the statements made in it. Firstly, my impression of the paper when I first read it was that the author had already presupposed his own viewpoints even before conducting the research, i.e. those Hui who speak Tibetan are of Tibetan ancestry. The author makes an utmost attempt to persuade the readers to accept the view without leaving an iota of space for debate and discussion. All the references and works cited in the paper are from Tibetan documents that maintain the position of “Tibetan – Hui Muslims” and their origin and ancestry as Tibetan. The documents that the author cites are themselves well stocked with extremely prejudiced viewpoints. The author simply turns a blind eye to the good deal of research papers that maintain contrary views or those that are comparatively more objective. For instance, Tsedan (1983) refuted the paper “Islam in Kaligang: An investigation of Formerly Tibetan, Presently Hui” by Li Gengyan and Xu Likui (1982) in his paper, “Does Islamic Belief Alone Make a Hui?” In this paper, Tsedan retorts and refutes the claim made by Li Gengyan and Xu Likui that “those Muslims (Hui) who can speak Tibetan are of Tibetan origin and ancestry.” Similarly, Professor Chang Chung-Fu of National Chengchi University (Taiwan) published, “Historical Memory, Religious Consciousness and Ethnic Identity: An Investigation of the Tibetan Speaking Muslim Community in Kaligang, Qinghai.” Among the aforementioned research works, Professor Fu’s paper is comparatively more unbiased and objective, and it merits more attention from readers and researchers. But Tsedan’s views are also problematic for its limited scope of analysis. Although it is not sufficient to merely point out these two papers in rebuttal, but given the focus of Professor Tsongkha’s research paper, he simply could not neglect the views and works of these experts. Professor Tsongkha’s paper is not the first one that concerns the “Tibetan Hui” phenomenon; this is evident from the paper itself. He claims “there are already over hundred research papers written by specialists in Tibetan Hui studies.” There are quite a number of research works related to the “Tibetan Hui” of Hualong, however, what is undeniable is that many scholars tend to repeat the same stereotyped patterns of study after a preceding scholar’s academic findings on a subject. They accept the earlier works almost unconditionally. This type or method of inquiry can neither make any substantial headway nor innovation in research (this paper by Professor Tsongkha is not an exception). Therefore, inevitably, it makes people to call into question the purpose of writing such papers that only serve to increase a scholar’s number of publications but fail to gain new grounds or push forward serious thought and study. All these articles that contend the ancestry of the so-called “Tibetan Hui” to be Tibetan do not put forward any substantial content and context with regard to the historical background of Hualong Tibetans, i.e. such methods of throwing out the larger context by dwelling on to discuss local histories does neither deserve admiration nor advocacy. Those who understand the situation must also grasp the contributions made by the presumed indigenous Tibetans of Hualong region to Tibetan history, Buddhist culture and so on. Here, I will not give an example, but I believe those who are truly interested will go and find out themselves. Perhaps, one of the main reasons why this is ignored and overlooked is that currently there is not a single relatively complete and thorough historical monograph about the Tibetans of Hualong. As educated individuals and scholars of Hualong, we must take this matter to be of great importance; otherwise, we will always be stuck in that situation of awkward embarrassment and finger pointing, without any forceful argument for rebuttal or refutation. Similarly, another pressing issue that’s been precipitated and provoked by the “Tibetan-Hui” issue is that some section of people now question and doubt the identity of Tibetans who are presently residing in the Hualong region. They even imagine and speculate about whether or not these Tibetans will be “Islamized” or become part of this “Tibetan-Hui” phenomenon in the future. Concerning the youth who do not know much about the history of their homeland, they are frequently attacked by similar questions of interrogation or suspicion. So much so that some even do not dare to say that they are from Hualong, afraid and unable to endure the ridicule and mockery of some people (examples of such incidents have occurred in this very surrounding environment too). In the end, the ones that are directly affected by this issue are the Tibetan youth of Hualong who are deprived of their national self-esteem as well as confidence in their daily life activities. Although they have the capability of achieving many things, such prejudiced attitudes drive them insecure and inhibited. Similar issues will continue to trouble and torment the Tibetan youth of Hualong in the future. As Tibetan youth of Hualong of this generation, it is crucial for them to actively engage in understanding and learning the history and culture of Hualong. It must not be brushed aside with an attitude of indifference and insouciance. In conclusion, I neither wholly deny nor wholly affirm the claim that the ancestors of the Tibetan-speaking Muslims or Salar people in the Hualong region were Tibetan, because the existing research works on the subject are replete with dubious and doubtful points that demand further study and scrutiny. Especially, there is a critical need for a comprehensive study that takes into account and investigates the entire regional history of Hualong. We cannot discuss this issue by merely relying on some specific local histories departed and disconnected from its greater regional history. Like Professor Tsongkha’s contention to classify and categorize the Tibetan-speaking Muslims of Hualong community, in some parts of Gansu Province and Kaligang as “Tibetan-Hui” with the assumption and argument that their ancestors were Tibetan, such perspectives are exceedingly careless and negligent, and I cannot accept it. Having read thus far, perhaps some readers might expect that I offer a clear and straightforward “response,” i.e. whether or not the ancestors of those Tibetan-speaking Muslims or Salar ethnic people were Tibetan. I am afraid that I have disappointed them on this point. If this were something that I can give a “yes” or “no” response, then the subject of this research would not have become such a long-standing controversial topic. Even if I could give an affirmative or a negative reply, the presuppositions of my statement will also be prejudicial, at least with regard to the “Tibetan-Hui” issue of Hualong. I have reproduced the titles of some articles cited in this paper from “Muslims in Amdo Tibetan Society: Multidisciplinary Approaches” (2015) by Marie-Paule Hille (Ed), Bianca Horlemann (Ed), and Paul K. Nietupski (Ed). In this book, Chang Chung-Fu also has a chapter, “Self-identity versus State Identification of “Tibetan-Speaking Muslims” in the Kaligang Area of Qinghai: An Ethnographic Analysis,” which argues that ethnographical studies indicate that Tibetan-speaking Muslims in Kaligang are of two origins: local Tibetans who were converted to Islam and Muslim immigrants from Gansu Province who adopted Tibetan language and customs. As the author of this paper underlines, Professor Chung-Fu also cautions against the overemphasis on the Tibetan language as the main criterion for ethnic or national identity. I highly recommend this book for those interested to further explore and understand the complexities of historical, linguistic, and ethnic makeup of the Tibetan borderlands. This entry was posted in My Writing on April 12, 2018 by Observer. While most college seniors venture to an all-inclusive resort for their last spring break, I decided to take a more rugged approach and backpack through Europe (quite the opposite of all inclusive I might add). It turns out that many people fear the cold of Norway, Ireland, Belgium and Denmark in early March, making it the perfect opportunity to downplay my experience as a tourist. I have never been to Europe before, but I have been to Asia, Africa and South America…not the norm, I’m aware. In each of the four countries that I visited, I traveled with ease on public transportation, ordered food by speaking in English at restaurants and asked numerous people for directions, simply expecting that they would understand and want to help…and everyone did. This entry was posted in My Writing on December 6, 2015 by Observer. This entry was posted in Bilingual Education, Tibetan Education and tagged Bilingual Education, Education, Tibetan on December 6, 2015 by Observer. Khashem Gyal. 2013. Valley of the Heroes. Documentary, color, 53 minutes. USD219 (institutional); USD2495 (home use), Documentary Educational Resources. Khashem Gyal’s film, Valley of the Heroes, focuses on language and cultural change on the northeast Tibetan Plateau. I watched the premiere at Qinghai Nationalities University in May 2013, and have since watched it several times. The film has been screened at various venues in the USA and internationally. 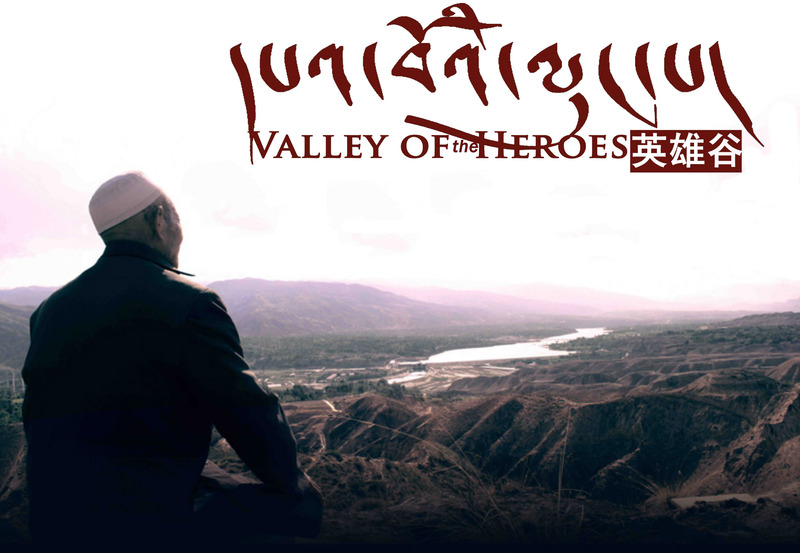 As a Tibetan from the area Valley of the Heroes focuses on – Hualong Hui Autonomous County – this film is of particular interest to me. Valley of the Heroes offers a rare glimpse at a pivotal moment of cultural and linguistic transition among Tibetans and Muslims in Hualong County, a remote community in Amdo, Tibet, part of what is now eastern Qinghai Province, China. Over the past several decades, Tibetans living in Hualong have experienced rapid cultural shifts, accelerated by language loss – today, more than 30% are unable to speak their own native language. The film spends time with an assortment of village residents and elders who reflect on the changes taking place in their community, and also documents a unique Tibetan language program that is attempting to address the situation. Valley of the Heroes serves as both a warning call and glimmer of hope for the future of Tibet. The film has subtitles in English, Tibetan, and Chinese. Japanese will be added for the DVD release. The subtitles use different colors for Chinese and Tibetan, allowing audiences who do not speak Tibetan or Chinese to appreciate how these languages are used together in everyday conversation. The film focuses on the complex relations between language, religion, and ethnicity. We meet several elderly Muslims who speak Tibetan fluently, and who claim that they were originally Tibetans who subsequently converted to Islam. The film shows how all local youths now speak only Chinese, or speak Tibetan mixed with Chinese. It also shows a group of Tibetan student-volunteers who teach Tibetan to local children, under difficult physical conditions. The volunteers clearly consider that the Tibetan language and culture will soon disappear from the communities they are working with. Additionally, the film shows several experts (Tsering Thar, Gyur me, and Tenzin Sangbo) discussing aspects of Hualong’s history and culture. Finally, the film depicts gambling, smoking, and drinking alcohol among Tibetans in Hualong. In terms of the subtitles in different language that indicates the intended audiences are Tibetans in general, people in China, and foreign audiences. And although the film focuses only on two villages, it is clear that it is intended to speak about issues of language and culture endangerment in Tibetan society more broadly. While appreciating Khashem Gyal’s passion for Tibetan language and culture that motivated him to make this film, I disagree with certain aspects of this film, which I wish to discuss here. I will begin with the poster for the film (see above). The poster shows an elderly man wearing a white skullcap, staring out over a valley from a mountaintop. The skullcap tells us he is Muslim and it seems that what he is gazing at is the Valley of the Heroes. I also feel that there is the implication that Muslims are socially and culturally the dominant group in Hualong. This poster makes me uncomfortable, and I assume many other Tibetans from my hometown would feel similarly. Many aspects of the film misrepresent the reality of Tibetan life in Hualong in a number of significant ways; for example, I disagree with the suggestion that the Chinese term ‘Hualong’ is derived from the Tibetan ‘Dpa’ lung’ ‘Valley of Heroes’. There are no historical records or explanations of this term. The correct Tibetan name for Hualong is Ba yan. There are different perspectives about the term ‘Ba yan’. For some, ‘Ba’ here means ‘cows’, and it is claimed, in jest, that Ba yan used to have more cows than people, suggesting that it was a poor, backward area. Others suggest that Ba yan is Mongolian meaning ‘rich’ ‘prosperous’. Such prejudices cause Hualong Tibetans to feel uncomfortable, because there has been a history of Tibetan-Muslim conflict in the area, dating to at least the time of the Muslim warlord Ma Bufang (1903-1975) in the early twentieth century. Local Tibetans also have a strong feeling of pride in their ethnic identity, and feel insulted and humiliated when others suggest that they are not ‘authentic’ Tibetans. For this reason, such beautiful names as ‘Valley of the Heroes’ were created, along with supportive background stories. People who don’t know the real situation of Hualong Tibetans take these inventions seriously, as the Chinese name Hualong sounds similar to the Tibetan for ‘Valley of the Heroes’. The Chinese term ‘Hualong’ has no particular meaning and is just the official name given to the county. Secondly, the film generalizes by using just a few villages to represent all of Hualong. The film shows scenes of several different areas, but does not clearly indicate where those places are. At the start of the film, a village is vaguely identified as ‘Chukhor Village, Qinghai Province, China’. Other places in the film are not named. However, my observations from watching the film suggest that the film was mostly shot in two villages. The first part of the film was shot in Qunke Village, Qunke Town, Hualong County, where the main ethnic group is Hui Muslims. The second part was filmed in a village of Zhaba Town, Hualong County, where the main ethnic groups are Hui Muslims and Han Chinese. In the second village, there are about fifteen Tibetan families among a total of more than 200 families. Using these two villages to represent the Tibetan experience in all of Hualong County is problematic. In 2014, Hualong had six towns, seven townships, four Tibetan autonomous townships, and a total of 362 administrative villages. There are twelve ethnic groups in Hualong, such as Hui, Han, Salar, Tibetan, Tu, and so on. The population of Hualong is about 220,000, among whom more than 60,000 people are Tibetan. This means that its Tibetan population is close to the Tibetan population of Rebgong County and larger than the entire population of such ‘Tibetan’ counties as Jianzha (54,000) and Zeku (53,000) counties. Thirdly, the topic of Tibetan conversion to Islam is controversial, and there are no reliable materials to illustrate the truth of the situation. Some people believe that those Tibetan-speaking Muslims were originally Tibetan, because they speak Tibetan well. In that case, if I speak Japanese very well, should I be considered Japanese? And because I speak and write in English, should I be considered English? Another reason is that Hui do not have their own ethnic language, and so speak the dominant language of their environment. The large Tibetan population in Hualong perhaps influenced them to speak Tibetan. In the film, an old Hui man kept saying that his parents spoke Tibetan and that he was originally a Tibetan who converted to Islam. It is implied that General Ma Bufang forced him or his parents to convert to Islam. However, if he identifies himself as Tibetan, why doesn’t he want to convert back to being a Tibetan? There is no longer a warlord like Ma Bufang or anyone else forcing him to be Hui. That man is free to be anyone he thinks he is. What is he waiting for? This highlights Hualong County’s complicated ethnic mosaic. It is difficult to discuss such historically complex issues without conducting more thorough research. Fourthly, as a film addressing the situation of Tibetan culture and language in Hualong, by avoiding introducing the local Tibetan culture, the film gives a very limited view of Tibetan life in the county. Local Tibetans have unique dress compared with other counties, and their Tibetan dialect is slightly different, since it contains many elements of archaic Tibetan. Therefore, it is sometimes difficult for Tibetans from other Amdo regions to understand the local dialect. Furthermore, Hualong has the well-known monasteries Bya khyung, Dih tsha, and Dan tig and many small monasteries (Lama Cairang and Renqing Kanzhuo 2010). Hualong has also produced an enviable number of knowledgeable Tibetans, including three Dga’ ldan throne holders, Bla chen dgong pa rab gsal (832-915), and Gsong rab rgya mtsho (1896-1982). Some communities in the eastern part of Hualong County have now begun to enthusiastically practice and promote Tibetan culture in the past ten years. For example, some villages in Jinyuan and Tajia Township fine people who do not speak pure Tibetan or who do not wear Tibetan robes in the village. In 2013, these places invited Ldong yon tan rgya mtsho (b. 1974), a great monk, lecturer, and writer, famous for promoting Tibetan culture and language. Afterwards, his lectures were made into DVDs and distributed in local communities and townships in Hualong. These lectures proved influential and the daily topic of conversation among many local Tibetans turned to promoting their culture and language. Admittedly, schooling in the Tibetan language is not good in Hualong. Nonetheless, the schooling situation does not necessarily influence the spoken language, which is still maintained strongly in most Tibetan communities in Hualong. I noticed in the film that a Tibetan woman is asked that if youths can sing Tibetan folksongs. Loss of traditional music is a global phenomenon (Grant 2014) and to single out these young Tibetans for not knowing traditional folksongs seems to be almost blaming them. It also gives a misleading impression about Tibetan culture in Hualong, which is actually very strong. A final criticism is that this film lacks narration. Instead, it is largely an interview-based documentary focusing on conversations between the film-maker, local people, and several experts. The lack of narrative creates difficulties that could have been solved if a narrator had provided background information. The pace of the film is slow, and much of the content is repetitive. Several experts provide superficial background information about Tibetans in Hualong. While it is difficult to represent Hualong County’s diverse population in a fifty-three minute film without narration, it is crucial to provide accurate representations and avoid generalizations. As this film gains popularity through social media, both in and outside of China, the only thing many viewers will know about Hualong is what they see in this documentary, which offends Hualong’s Tibetans through its misrepresentation. Promoting awareness of Tibetan language issues is laudable, but it is crucial to give correct information and a more holistic picture of Tibetans in Hualong. Lama Cairang and Renqing Kanzhuo. (2010). Hualong Zangzu Xianzhi: Qiannian Tuzhu Wayanba. Qinghai, Xining: Qinghai Nationalities Publication. Wang Shengkui, & Liu Chenggang. (1994). Hualong Xianzhi. Shanxi, Xi’an: Shanxi Nationalities Publication. Many thanks to Dr. Gerald Roche, Tim Thurtson (PhD Candidate), and Dr. Kevin Stuart for their editorial assistance. A preview of the film is available at http://vimeo.com/103383084. The village name is not mentioned in the film. Dorjie Kyid provides the number of Tibetan families in the film. The number of total households in the village is mentioned by Pen Jun in the film. A Tibetan county in Qinghai that has the biggest Tibetan population among Qinghai counties. The most senior degree in Tibetan Buddhist Philosophy. There have only been 102 such degree holders to date. One of the three wise men, who have significant contributions of revitalizing the Tibetan Buddhism. This entry was posted in Film Review, My Writing on January 25, 2015 by Observer.